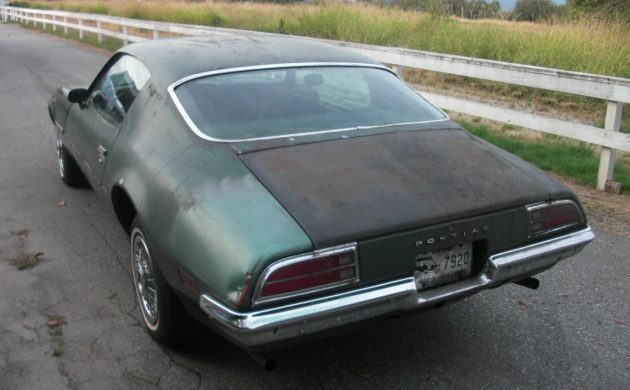 After an initial three year run of its original body style, Pontiac Firebird, as well as Chevrolet Camaro, came out with a totally new body style midway through the 1970 model year. These cars benefitted from a fastback roof, and gone were the convertibles. Firebird was offered in four models; a base model, luxury-oriented Esprit, totally performance Trans Am, and this mild performance Formula 400. Only 7,708 of the Formula 400 were made in 1970. 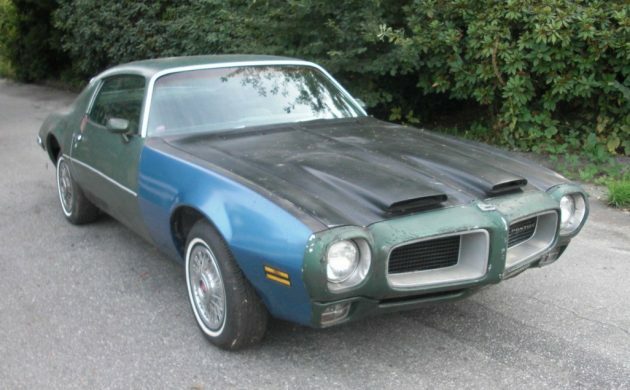 This is a 1970 Pontiac Firebird Formula 400 for sale here on eBay in Pitt Meadows, British Columbia, Canada. The Formula 400 is wearing three different colors of paint, plus some paint issues that make it look like its wearing several more. The seller calls this Verdoro Green, but I think its actually a different shade of green called Pepper Green. The paint is definitely tired but the only dent that can be seen is a minor one on the driver’s side rear fender edge near the taillight. 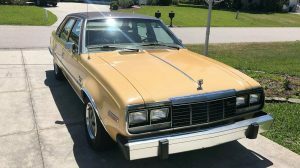 The seller describes the car as complete but tired and in need of a rebuild. However, the car has some rust issues and is in need of front floors, trunk floor, rear frame rails, and rear valance. Unfortunately, no pictures of any of these issues are included. The seller even mentions that it could be used as a parts car for a Trans Am, but at the Buy it Now Price of $7,900, it’s a pricey parts car. But if you have a Trans Am that need what this one has, it might not be such a bad deal after all. The Formula 400 has a fiberglass hood with twin hood scoops. The interior appears to be in good condition. We find here bucket seats with a center console. 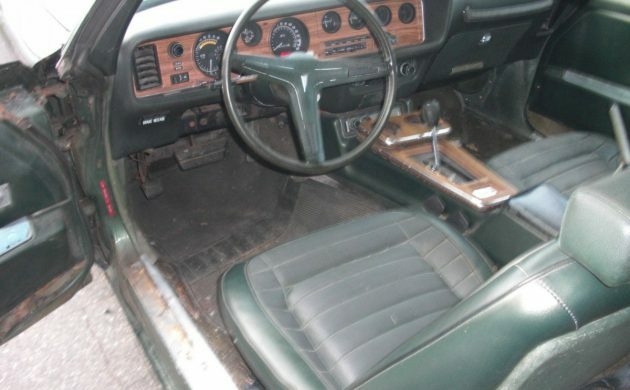 There are no tears or rips on the seats and no cracks on the dash that can be seen in the pictures. This Formula 400 is equipped with power steering, power brakes, non-working air conditioning, power windows, and rally gauges including a tachometer. The engine powering this car is standard for the Formula 400, a 400 cubic inch V-8 that according to sales brochure produced 330 horsepower (seller says 350). This is one of 4,931 Formula 400s that had the Turbo Hydra-Matic Transmission. 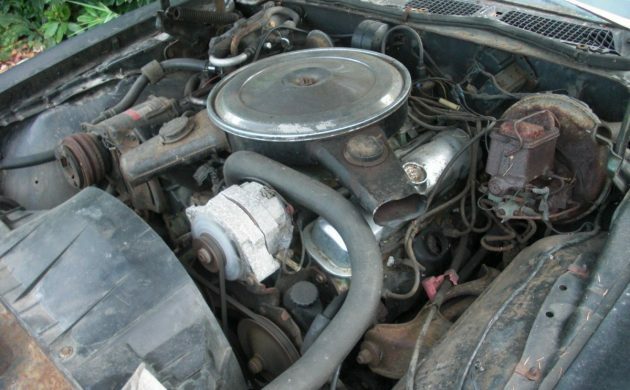 The seller believes all engine components are original except for alternator and starter. The car runs, stops and steers. The mileage listed in the ad is 10101, but I believe that probably means 101,000 miles. So, what would you have in mind for this car? 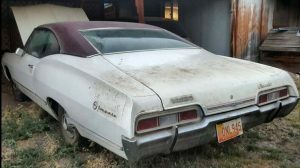 A total restoration or a parts car for an early seventies Trans Am? With the rust issues handled and a new paint job and early style snowflake wheels. Also change steering wheel to Trans Am style. Rebuild engine with a few tricks added like they installed on the Macho T/A’s and I would drive this Poncho all the time. I like the Formula’s because they are a little more suttle. But still run like a beast. Had a friend who installed a HO Racing turbo on his 4 speed 76 Formula back in the day and I credit that car for getting bit by the love of power. That is definatly not a parts car, it would be a shame considering how complete it is. I don’t think this is a actual formula 400. Looks to me to be a plain firebird, hub caps and a standard steering wheel??? Wasn’t the steering wheel the vega gt style?? Didn’t they have snowflake wheels?? I could be wrong but I smell a rat. Just so you know, you’re very wrong…..
“Snowflake” wheels wouldn’t exist for another 7 years after this car was made. The Formula wheel is NOT a Vega GT wheel and it was only standard on a Trans Am, so yes a Formula would have a base steering wheel if no steering wheel option was picked. Rally II’s were also not standard on a Formula either. So they would come with wheelcovers. I am almost certain that the Formula steering wheel was OPTIONAL all of the Firebirds except for the Trans Am … on which it was standard equipment. Appropriate upgrade would be the honeycomb wheels, gents, if one was so inclined. I owned a Formula 400 three years newer than this but the same color and accessories. Most boring steering wheel ever for a performance car. It was parted out so that others could live, as the whole body was becoming one with the earth. 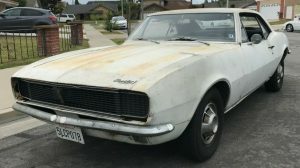 Generally I like Camaro’s better but this era with the exposed nose of the front bumper is my favorite of all of the Firebird, Camaro lines. The visibility to the rear is not that great, neither is use of interior space but for a sporty 2+2 from an american maker these were one of the best to ever come out of Detroit. Make certain it has the best brakes you can put on it, get the paint to look like new and then any V8 will be sufficient for power. I understand Steve S’s wish for maximum power but without substantial changes to the chassis the 455 is just too much weight up front and it destroys the balance that these had with the lighter engines. This is not and has never been a point and squirt kind of car. This is a handler and should be kept that way. There are others that could benefit from the larger engine and there would be no noticeable handling difference. I believe the Formula steering wheel and the rear spoiler were individual option boxes you could tick when ordering any trim level above the base. 25 years ago I bought a rust free 70 455 automatic barn find . Most likely trans am. All wheel flares and center type carb hood scoop. No engine. Was very fixable. 150 ‘ll he Speedo. Made a race car out of it. Stupid me. How many production was this car.? What would it b worth today? I like the hood scoops on the old Formula’s better than the TA reverse facing scoop…even if this doesn’t actually scoop anything to the carb. Plus, these lacked some of the eye candy the TA had which is just fine with me. But those plain jane rims have got to go. Would rather see period correct mags than anything else. 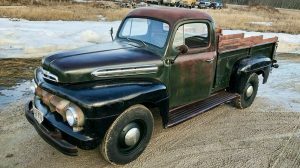 With the green interior that really narrows down the choice of paint to use, keep it green except for the ‘glass hood, make that black but not shiny. Kinda like this mess here. Lots of one year only parts on a 70 like the low back buckets. Restored this car would be sweet!